Learn to sing is a complete vocal education. It includes more practical information on singing than any other volume, and debunks many of the myths about singing that have been circulating for decades. In addition to the expected vocal exercises, it also includes ear training and sight-singing exercises, allowing the student to improve not only on his or her vocal development, but also on musicianship. Use this option to order the Vocalises CD, without the book. 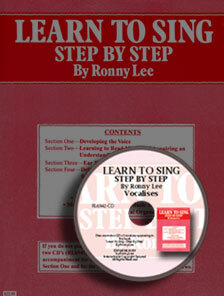 "LEARN TO SING STEP BY STEP is a most stimulating and informative approach to the study of vocal production. It contains every facet pertaining to voice, including relevant subjects such as ear training, sight singing, and an excellent selection of vocal exercises. All this served up in a palatable and easily readable format that will interest aspiring voice students, teachers and laymen as well." ©2013 Ronny Lee Publications, LLC. All Rights Reserved.